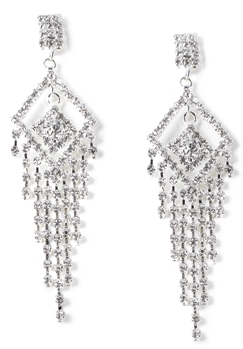 A cluster of rhinestones will embellish the earlobe. Dangling from this cluster, is the outer row of rhinestones from which the chandelier is formed. At the heart of the chandelier is a smaller rhinestone diamond. FWO Extras: These light weight earrings are pierced and measure approximately 2 1/2 inches long.